The annual SMA Novena in honour of Our Lady closed with SMA and OLA members along with supporters, family and friends gathering at Our Lady’s Shrine at Knock, Co Mayo for the ninth and final day of the Novena. Though overcast, the rain stayed away until all were gathered into the Basilica for the 3pm Mass. The SMA Provincial Leader, Fr John Dunne, along with more than 50 SMA priests celebrated the Mass in the Basilica at 3pm on Saturday, 25 May. Among them were Fr Reginald Nwachukwu, the SMA Superior for the Bight of Benin District-in-formation, Fr Richard Wall who was home on leave from Nigeria and who has completed 57 years in that country, Fathers Pauric Kelly and Michael O’Shea who were home on leave from their work in St Augustine’s Major seminary in Zambia. Among the Principal concelebrants was the emeritus Bishop of Paisley (Scotland), Rt Rev John Mone who leads a group from Scotland to Our Lady’s Shrine at this time every year. The Bishop of Killaloe, Rt Rev Kieran O’Reilly SMA, preached the homily. A multicultural choir, under the care of Sr Marie Dunne CHF, led the singing of the revised Mass for the Spread of the Gospel which Sr Marie composed for the celebration of the 150th Anniversary of the foundation of the SMA in 2006. Members of the FVC and other SMA supporters participated in the Mass and the earlier Pilgrimage ceremonies (Rosary Procession, Stations of the Cross and Benediction). 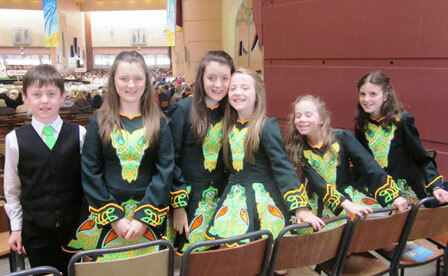 Students at the International Religious Formation Ministry programme at Loreto House, Dublin animated the Alleluia and Gospel Procession while members from the Mary Baxter School of Irish Dancing in Omagh participated in a lively, and much appreciated way, in the Offertory procession. Fr John Dunne concluded the Mass with expressions of gratitude to all our supporters, those gathered in Knock and those who participated in the Novena from their homes, as well as all who helped to make the closing Mass such a lively and joyful celebration. The OLA Sisters were also involved in the Pilgrimage, with Sisters from their different communities in Ireland as well as Sisters home on holidays or visiting from Nigeria, Ghana and Tanzania. 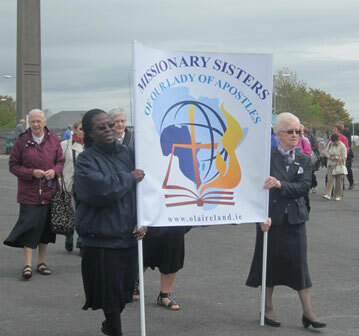 Sr Patricia McMenamin and Sr Theresa Kusi (from Ghana) carried their banner in the Rosary procession. After Mass the pilgrims headed back to their buses or cars for the long drive home to all parts of the country: Maghera, Lurgan, Toomebridge, Achill, Claregalway, Tarmonbarry, Dublin, Neilstown, Wexford, Drumcollogher, Cork, Skibbereen and Waterfall to name a few. 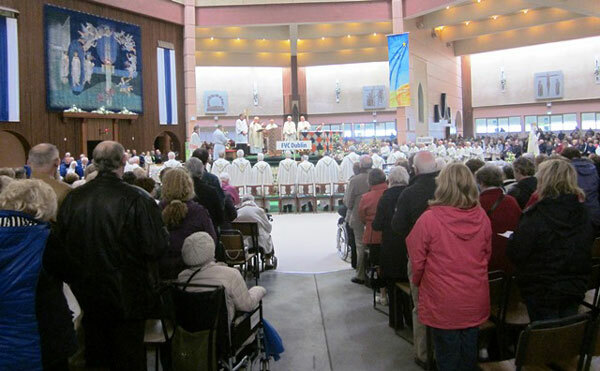 In his remarks at the Mass, Fr Richard Gibbons, Parish Priest of Knock and Rector of the Shrine, said that the SMA Pilgrimage was among the most colourful and ‘lively’ of the annual pilgrimages. We are grateful to all those who helped to make this, the 33rd pilgrimage, live up to that billing! God grant we meet again on the 4th Saturday of May 2014. More pictures and report here.